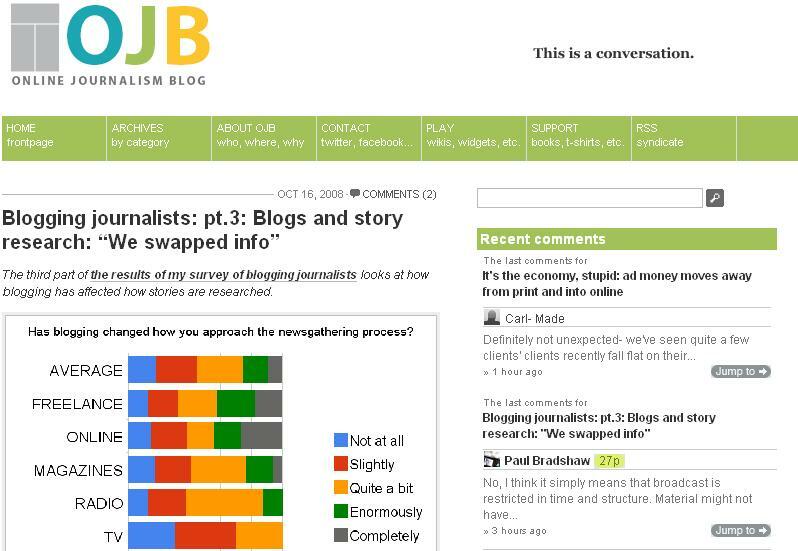 Paul Bradshaw’s Online Journalism Blog publishes the third part of “Blogging Journalists“, a survey on how blogging is changing journalism. “The networked, iterative and conversational nature of the blog format is changing how many journalists work in a number of ways”, says this study’s author. The first part wan on context and methodology, the second one on how blogs affected journalists generate story ideas. The third part investigates in which way blogs have affected story researching. A fourth part of the survey is forthcoming, and it will deal on how blogging affects information gathering for a story. Paul Bradshaw is Senior Lecturer in Online Journalism at Birmingham City University’s (UK) School of Media.